I had a kit for more than a year, and finally got the courage to make it. The kit is from McQueenie Miniatures . 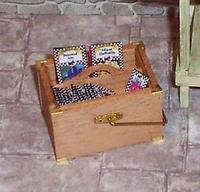 I used it to put the Manorhouse gardener's seed packets in,these are printables from paperminis .